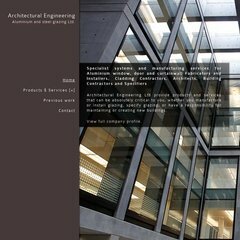 Topics: Aluminium Glazing Systems, Structural Glazing, Unitised Curtainwall, Steel Glazing/fire Screens, and Cold-plated Metal Finishing. The site has about 164 users daily, viewing on average 1.40 pages each. A-e-l.co.uk's IP address is 212.78.80.14. It has 2 DNS records, ns.123-reg.co.uk, and ns2.123-reg.co.uk.